One of these coulrophobic individuals is a very good friend, actually, and last year we were at the rodeo out in Lake Chelan together. It should come as no surprise that there was a rodeo clown there. Thankfully, rodeo and circus clowns are two very different beasts. Apparently one steals your soul, the other risks his life against out-of-control horses and bulls. As such, my friend didn’t have the expected fear response, and it opened up a dialogue. Out of this, I got the kernel of a story idea about a boy growing up with a mother who loves clowns. And by that, I mean she REALLY loves clowns. I was never really sure what to do with the story. It wasn’t horror. It wasn’t really urban fantasy or mystery or anything that I typically wrote. At it’s core, it was a bittersweet tale about a fatherless boy and his relationship with clowns as he begins to form his own sense of self-identity. So it remained a concept. I didn’t do more than sketch out a few lines of notes. Then a few months ago, I was poked to write a story about “legacy.” I started working on a horror piece that I might one day finish. But it just never gelled. It wasn’t the story I wanted to be telling. It was, instead, the story that I was expected to write…the disturbing horror tale. And that’s all well and good. Maybe someday I’ll write that. In the meantime, I have a story now fighting to get out. It’s about a lonely boy, a distant mother, a sort of surrogate father in greasepaint, and a legacy to uncover. It might not be what anyone expects, myself included. But it is the story I need to tell. 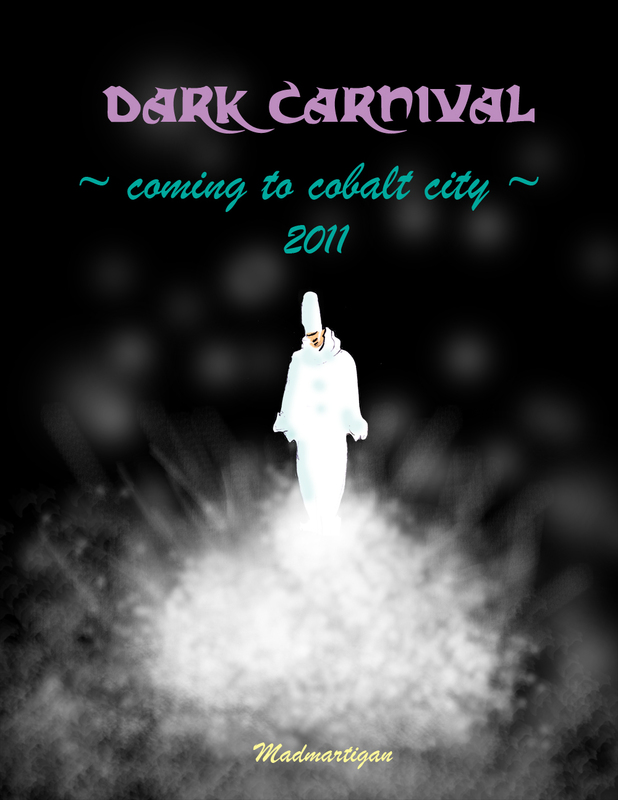 Maybe it’s because of all the reading I’m doing for Cobalt City Dark Carnival. I don’t know. The muse speaks, I listen. So strike up the calliope, tack on your squirting flower, and slip on your size 24W shoes.